Dr Tony Farrell is a general practitioner in Mount Maunganui and has a Fellowship in Addiction Medicine. He has a special interest in managing patients with hepatitis C in primary care and has kindly agreed to share his experiences and thoughts with our readers. With the addition of Maviret to the pharmaceutical schedule, providing curative treatment to people with hepatitis C is now easier than ever and Tony encourages all primary care clinicians to find their “hepsters” and make a difference in their lives. It is so rewarding to be able to tell a patient with a stigmatised and progressive chronic disease that we can cure them within eight weeks. As a hope salesman, that’s about as good as it gets. Over 25 years ago, my first patient diagnosed with hepatitis C was thrilled that I had figured out the cause of her liver dysfunction, but the ensuing hepatoma turned her relief into dismay, and she died an angry woman. My work over the years with patients who experienced difficulties with alcohol and other drugs led to multiple hepatitis C diagnoses, but I often found that patients had variable motivation to go into treatment – and for good reason. Interferon and liver biopsies were notoriously arduous, and my observations of the sallow pallor of those willing to endure flu-like side effects for a year made me more understanding of those who wished to risk cirrhosis and cancer instead. Recently during a consultation a patient recalled just how bad he had felt during that treatment due to sleep disturbance, sweats and low mood. He even said some nights he didn’t think he would make it to morning. No wonder many patients have tested positive in the past and are still sitting in our practices with malaise and surreptitious scarring of their liver. The sheer pathological load of the hepatitis C virus is striking when you have a number of patients with hepatitis C to look after. I have witnessed the death of two patients after clearing their 20-plus years of hepatitis C infection using interferon. One I had to advise had an incurable gallbladder cancer, and the other developed a fever of unknown origin and died three weeks later from a fulminant lymphoma. Currently I have a patient who is doing well after liver transplant for hepatoma, one who might get a transplant if things go well enough, and a further patient dying at present as his liver cancer is too advanced. The stigma of hepatitis C is another significant reason as to why a large proportion of people don’t receive treatment. My own biases have become most apparent to me, especially realised when a well-to-do middle-aged lady complemented me on my dress sense one morning, prior to disclosing her hepatitis C status. She was so concerned about my ensuing reaction that the anxiety was palpable. This person had developed an addiction to prescribed medication at a later stage in life, and I had simply overlooked the possibility that there may have been risk factors for hepatitis C in her past. Some patients express huge gratitude and relief when you can offer confidential investigation and treatment from within the general practice clinic, an indication of the sense of shame and distress that they carry. The stigma of infective illness occurs in many domains, including the health sector. Many people with hepatitis C fear being infectious and take measures to limit perceived exposure to others, e.g. eating off paper plates or avoiding swimming. There is also trepidation about the reaction of others to disclosing their hepatitis C status, e.g. being met with silence, a workmate disinfecting the table when they leave or a health worker donning a second set of gloves. Adding to the stigma, patients are likely to receive a far kinder response from health workers if they disclose a needle stick injury rather than intravenous drug use (the most common risk factor) as the mode of infection. I will never forget reading an audit of a colleague’s practice whereby his medical reviewers had concerns as he had not washed his hands after shaking hands with a “hepatitis C patient”. While we now have the tools to eradicate this virus, we still have a long way to go in terms of acceptance. It is important to be mindful that hepatitis C has often occurred during a phase in a person’s life when risk taking was more prominent. Some people carry other diagnoses or traumas around these events, so being empathic and non-judgemental is paramount. 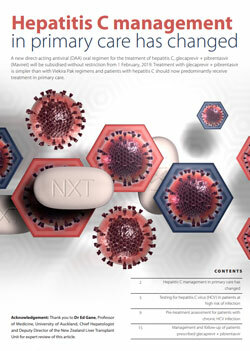 With the advent of direct acting antiviral (DAA) medicines, more people with hepatitis C came forward for treatment, but they generally had to access these ground-breaking drugs via clinical trials or pay for the three-month treatment regimen themselves, which cost $50,000 or more. DAAs were efficacious for around 90% of patients, a vast improvement on the 50–60% success rate for interferon. They were also very well-tolerated. In 2016, PHARMAC funded the oral DAAs Viekira Pak and Viekira Pak with ribavirin, suitable for people with virus genotypes 1a and 1b, which accounted for around 55% of people with hepatitis C. Harvoni was funded for people with any genotype of hepatitis C if they met certain criteria, i.e. their livers were decompensating. James Freeman’s Fix Hep C website (the “Hep C buyers club”) was therefore a godsend to patients who didn’t meet the criteria for subsidised treatment, enabling access to considerably cheaper DAA medicines from overseas. One patient whom I had never previously met came in with a box of chocolates because I was prepared to do the online paperwork and sign the customs declarations for the Fix Hep C drugs. With wonderful support from the specialist hepatitis nurse and the patient’s gastroenterologist we cleared his virus using a now obsolete pathway. From the 1st February PHARMAC will fund the pangenotypic DAA glecaprevir + pibrentasvir (Maviret), which can be used by all patients with hepatitis C and obviates the need for the import of generics and previous treatments such as Viekira Pak. Maviret is a low risk drug combination, with efficacy of up to 99% and relatively few interactions with other medicines. N.B. I use the Liverpool HEP Drug Interactions checker ( https://www.hep-druginteractions.org/checker) for every DAA prescription and have found it to be speedy, accurate and reassuring. Now that treatment is so simple, primary care should get organised and orientated so that we identify and treat a large number of patients with hepatitis C within general practice clinics. I have found the clinical teams involved in hepatitis C to be very progressive and willing to help, and hepatitis C is no longer viewed as a specialist-only issue. I have also treated patients I have not met, after medicolegal advice that if a well-trained specialist nurse has a full medical history and results for a patient, then I could legally sign a prescription on their behalf. This was particularly satisfying because I was able to treat people presenting to needle exchange, knowing they were in the competent hands of a hepatitis nurse, backed up by infectious disease specialists and gastroenterologists. This is an example of how collaboration with your local hepatitis C co-ordinator can really make things happen. It is now up to us to help meet New Zealand’s obligations under the World Health Organization target to eliminate hepatitis C by 2030. Treatment is prevention, and prescribing Maviret will involve very little paperwork, and a modicum of assessment. A National hepatitis C plan will be finalised this year, WINZ funding is available for consultation fees to treat hepatitis C, and the treatment is well tolerated and effective. So I urge my colleagues to embrace this opportunity to identify their “hepsters”, and really make a difference in their lives.